This brig of 227 tons, built in New York in 1806, was hired in 1812 as ‘First additional temporary Packet’ and Captain John Tilley received a commission from the Post Office dated 13th January 1812. In 1819 he acquired the Packet Camden and command of the Foxpassed to his brother Lieutenant Charles Tilley, RN. She was retained in the Service after the war, and in 1820 yet another brother, Thomas Tilley, took over command, receiving a commission on 10th December ‘in room of his brother’. 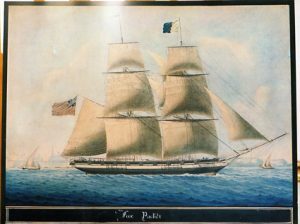 She was discharged from the Packet Service in 1823.On arrival at Falmouth from Malta in 1814 she was quarantined because of an outbreak of plague on the island. The painting shows that she carried a figurehead in the form of a fox. Both this painting and that of the Lady Mary Pelham have identical signatures and use a similar script in the cartouche. And in both the sea is well painted, being built up with small washes to give delicate detail. Yet they each have a distinct approach that does much to dispel the impression of a painter applying a rigid formula without thought. The Fox is shown heading west and the Lady Mary Pelham heading east so need the morning and the afternoon light respectively to cast modelling shadows on the sails. The shadows ashore also reflect this and the artist has captured a distinct and different atmospheric quality in each painting: in this of the Fox hazy and diffuse while in that of the Lady Mary Pelham clearer, the buildings standing out with sharper shadows. Cammillieri must have been familiar with the view of Valleta from offshore in many different lights. In this painting of the Fox he has introduced two local craft with lateen sails to give a more distinct Mediterranean location and has also included the coastline beyond the walls of Valleta.